I haven't been following this thread but I could have sworn that when I looked at the Stowa site yesterday that the MABLE was sold out? Now there are 11 available? I saw that too. That means 11 people had changed their mind and cancelled their orders. It's interesting, I nearly ordered a brushed case model when they first released the pre-order but now after seeing the photos I probably would have changed to polished. I guess there would be changes of mind between brushed/polished and date/no date, but that wouldn't necessitate cancelling? It seems that these cancellations have followed hot on the heels of the release of the photos. I can understand it in the case of the fliegers due to the lume but I wonder what people are thinking with the MABLE? Last edited by catlike; March 24th, 2017 at 18:06. Ok. The w&w video win me over with polished case. Not sure you can read too much into timing of changes on availability counts. They've been changing throughout preorder phase, but not as pronounced when we go from 55 available to 58, then down to 54, then back up to 57. We also don't know that all 12 cancellations occurred in the past 24 hours. But I'm sure there are some minds changing as new watches are released from other brands. EDIT: And now down to 2 available, but I'm sure it will continue to go up and down until payments are required. Last edited by Zinzan; March 25th, 2017 at 21:00. Wouldn't that render the lume a bit useless? I mean, what is the point of seeing the numbers in the dark if you can't see the hands? That smudge on the lug convinced me to stay with the matte case...otherwise a thing of beauty that dial, the only other I have that can compare to it is my Seiko Presage Urushi..Can hardly wait to see it in person. I'm replying to flappylove comment as above. But the flieger hands already are blued??? They have lume also. So you are asking for the option that is already standard? Thank you very much for the photos. 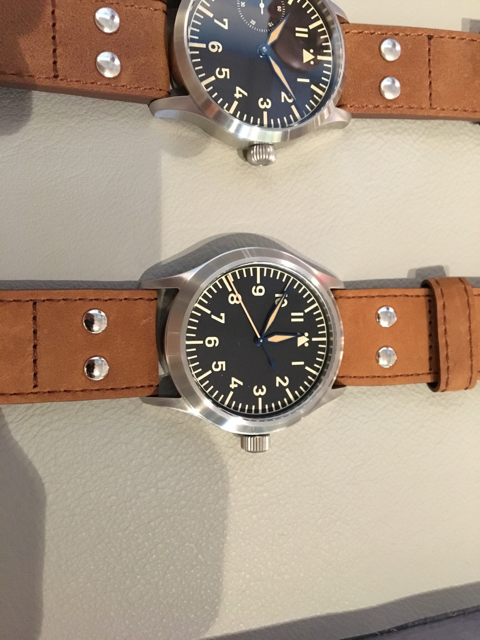 Nice to see that Flieger lineup for the relative size perspective. Wish I was there. Got any more? 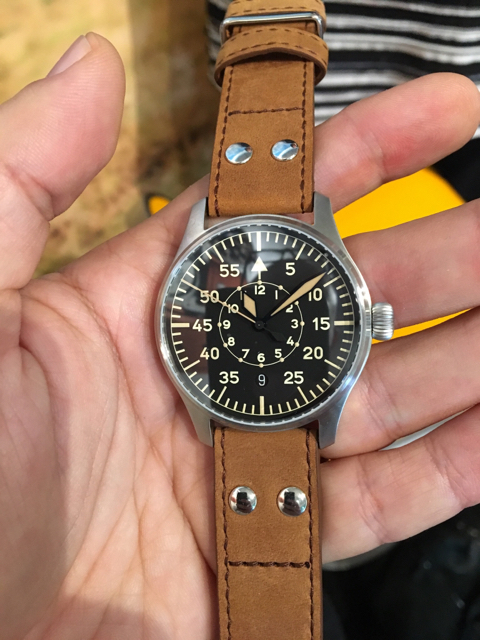 Edit: That B dial Flieger is stunning! Last edited by B....; March 25th, 2017 at 00:55.